Carbohydrates are one of four major classes of biological molecules, along with nucleic acids, lipids , and proteins . They are the most abundant biological molecules, and are an important nutritional component of many foods. Carbohydrates are usually composed solely of carbon, hydrogen, and oxygen, although some also contain nitrogen, sulfur, or phosphorus. Carbohydrates are classified according to size. The smallest carbohydrates are called monosaccharides ( mono means "one"; saccharide means "sugar"). As the name implies, these are single sugar molecules. The most common monosaccharides, such as fructose and glucose , have six carbon atoms, but monosaccharides can have as few as three or as many as seven. Monosaccharides with five or more carbons usually have a ring-shaped structure when they are in a solution. Oligosaccharides ( oligo means "few") are more complex carbohydrates composed of chains of two or a few (up to about twenty) simple sugars joined with a type of covalent bond called a glycosidic bond. The longer oligosaccharides may be linear or branched. The most common oligosaccharides, composed of only two sugars, are called disaccharides ( di means "two"). 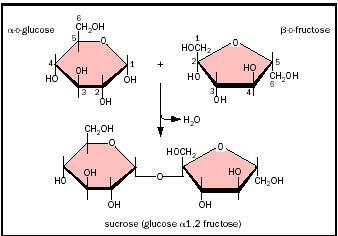 The most common disaccharide, sucrose, or cane sugar, consists of a glucose molecule bonded to a fructose molecule. Other important disaccharides are maltose (two glucoses joined together) and lactose, or milk sugar (glucose joined to galactose). Longer oligosaccharides are usually bound to other molecules, such as lipids or proteins, to form glycolipids and glycoproteins, respectively ( glyco means "sweet"), rather than being free in solution. These kinds of molecules are important in cell recognition, signaling, and adhesion , and are commonly found on the outer surface of cell membranes. Polysaccharides ( poly, means "many") are important energy-storage and structural molecules. They are formed of long chains of sugars, most commonly glucose. Like oligosaccharides, they may be linear or branched. Important polysaccharides are starch, glycogen (animal starch), cellulose , and chitin . Starch and glycogen are similar energy-storage molecules found in plants and animals, respectively. Both are made of glucose molecules that are bonded in the same manner; however, glycogen has a higher degree of branching compared to starch. Cellulose is also made of glucose, but the individual glucose units are linked differently, resulting in a long, fibrous structure that is not soluble in water. Cellulose is the main structural component of most plant and some protozoan and bacterial cell walls. Wood is largely cellulose, and paper is an almost-pure sheet of cellulose prepared from wood. Cotton is also nearly pure cellulose. Chitin is similar to cellulose, but its sugar subunits are a modified form of glucose called N -acetyl glucosamine. Chitin is the main structural component of fungal cell walls and of animal exoskeletons , such as the shells of insects and crustaceans. Other important structural polysaccharides form the matrix of cartilage and other connective tissues of animals. Carbohydrates are at the center of cellular metabolic pathways. The most fundamental process, glycolysis , uses glucose to produce energy for cellular needs. Sharon, N. "Carbohydrates." Scientific American 243 (1980): 90–102.